This nail art design is the most quick and trendy nail art that you can get at home. We will be using regular different color nail paints along with a toothbrush to create the splashes. 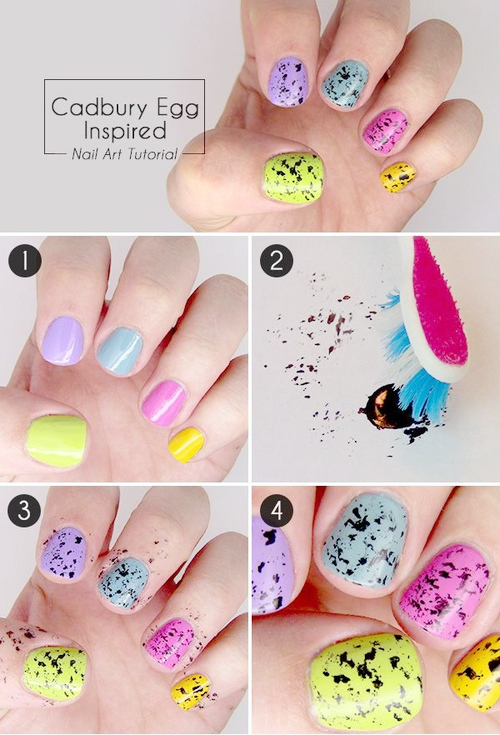 We are taking this tutorial to guide you how you can easily get this nail art done. ☛ First you need to coat your nails with the base coat. ☛ Base coat preserves your nails from the chemical hazards of the nail paints so it is a good practice to have it before you start any nail art. 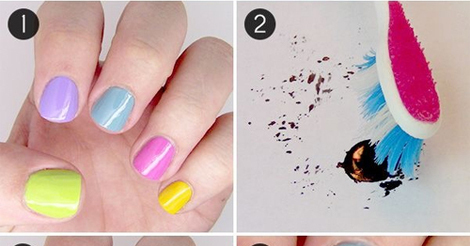 ☛ Now paint your nails in different shades using the different nail paints. ☛ Wait for some time until it gets dry and properly set. 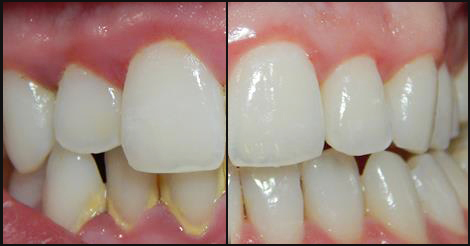 ☛ Now pick the old toothbrush of yours or the one which is no longer in use. ☛ Dip the bristles into the black nail paint. ☛ Now drop that black footprints on to your nails. ☛ Clear off any of the extra splashes from your skin using the nail paint remover. Your nails are looking like some precious eggs with different colors and black patches at the top.